It’s a nice morning the day after Christmas and we get a tip that Stuart Granen, owner of Racked 38 member, Architectural Artifacts will be salvaging a large chandelier from a condemned church on near southwest side to sell in his shop. We show up, there looked to be a groundskeeper talking to a man in the street who we realize showed up minutes before we did claiming to be a preservationist and telling us nothing should be harvested from the church. After walking around the chain linked fence and realizing part of a gate was unlocked we meander through a yard of broken vehicles and large pieces trash. There is one open door with a very crooked staircase which we proceed to climb to the second level. Here we find a hired man communicating with Stuart who is inside of the ceiling trying to figure out how to get the chandelier down without the building falling in as they do it. Stuart explains that it was most likely gas powered around the time when the building was built in 1894. It is nearly impossible to get it down without erecting scaffolding so he’ll have to do it the following morning. 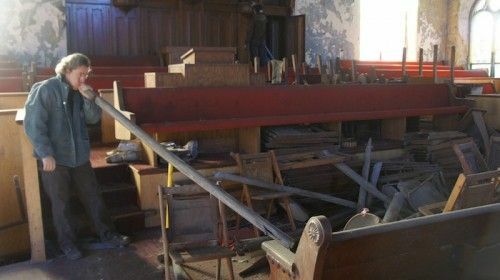 He and his workmen proceed to dismantle wooden sconces from the alter which will also be sold in his shop along with a lot of the pews and some random chairs from a synagogue. He plays around in his canvas jacket and work boots blowing through an organ pipe and standing on benches not minding the thick dust in the air. Every day this man gets to go exploring in places like this, and the beach of trash in South Hampton he was showing us on his digital camera. What’s next on Stuart’s itinerary? Well, he’s headed to South America for six weeks on Monday. He’ll be driving around Buenos Aires, Montevideo, the forest terrain in Chile, and Bolivia finding new buys for spring. Mostly veering away from larger pieces, Stuart is seeing a trend in his shop where more people are buying smaller accessories – which is what he’ll be concentrating on this trip.